John Alexander Middleton of New York. Someone very dear to me asked me a question regarding a possibility to her genealogy. Her great-grandfather was a Middleton and she wondered if it were possible that her great-grandfather could be related to Arthur Middleton, one of the signers of the Declaration of Independence. My initial thought was, “No — Arthur Middleton was from South Carolina and her great-grandfather was from New Jersey. Some time ago I had established that her great-grandfather’s father was William Middleton, born in New York in Nov 1872 and married to Lillian Bailey. I poked around here and there and finally found Family Search had an 1875 New York State Census which showed William Middleton as two years old with a brother and sister, Farris & Cora R. Was was surprised at just how many Middletons there were in the records. And of course, William, and his father John were really common so it was really had to determine which of many was the correct one. Luckily, his brother Ferris Middleton had an uncommon name which was easily traceable. A search, again on Family Search, resulted in a Death Certificate. Right age, right mother’s name. Oddly enough the death certificate had the name of the Father, “Don’t Know” stricken through and replaced with “John Alexander Middleton” and the birthplace as Scotland. The information regarding his parents seemed to be in a different pen and different hand than the rest of the Certificate. The informant was E. M. Qualthrough, a name I had never heard. Also the certificate notes that he had been in the hospital only one day and that his time in the state was unknown. I was somewhat confused. The 1875 census indicated that John Alexander Middleton was born in New York City. Utah, being the awesome genealogical resource that it is, had another death certificate. The one I had been looking at was apparently a county version. A State of Utah certificate also existed. In the State version, the informant was Cora R Holmes from New York City. That certificate also indicated that John Alexander Middleton was born in Scotland. 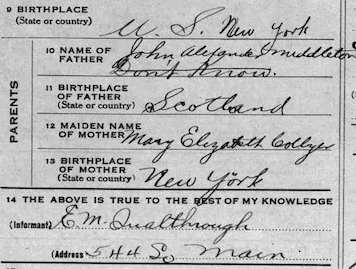 I am fairly certain that she would know where her parents were born, father in Scotland and mother in New York City. Because the Middleton line I’m looking at hit what appears to be a Scottish immigrant I’m fairly certain that it is extremely unlikely to be a relationship with Arthur Middleton, the Declaration of Independence signatory. I have more research to do in this line. I’d like to find his entry into the United States. I believe John Alexander Middleton and his wife, Lillian Bailey Middleton died between 1875 and 1880. Neither show in the 1880 Census and the children appeared to be scattered. Utah, Salt Lake County, Death Records, 1908-1949, Ferris J Middleton – 1912 . https://familysearch.org/pal:/mm9.1.1/nqhz-qjd. ; Family Search. Many thanks to Family Search. They are an awesome & free resource.